The final draft of the Io Decadal Survey White Paper has been posted online. The white paper consists of two sections: the first summarizes the state of Io science, the justification for NASA sending additional missions, and the outstanding questions that should be addressed by future exploration of the satellite; the second discusses an exploration strategy for addressing these remaining questions. The other submitted white papers can be found on the National Academies website; Van Kane has a good summary on his blog of these other papers. I previously posted a note about the recommendations for future missions to Io based on an earlier draft of the white paper. The latter goal can be helped by the examination of Europa to be performed by EJSM. Determine Io’s interior structure, e.g., whether it has a magma ocean. Determine whether Io has a magnetic field. This fits into the previous objective. As explained later in Part 1, understanding the state of the core, its Fe/S ratio, and its size would help us understand the result obtained by Galileo that suggests that Io does not have a magnetic field. Resolving the conundrum of why Io can be so active and not have one might help us better understand how planetary magnetosphere are created. 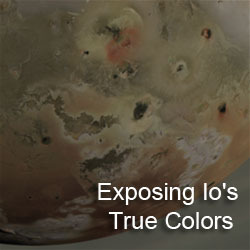 similar to Io’s, and elsewhere in the solar system. Two good places to provide comparative studies would be the Moon and Mercury. 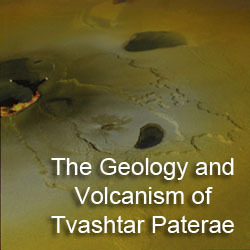 While these two worlds are dead as a doornail now (deader actually), earlier in their histories, they experienced volcanic eruptions similar to those we see on Io now, particularly flood basalt eruptions and pyroclastic flows. high-heat-flow conditions that may have existed early in the history of other planets. 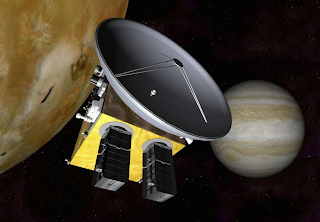 In addition to the high-resolution observations to be obtained by Io-centric missions discussed in Part 2 of the white paper, additional information could be gained for this goal from the Ice-Penetrating Radar (IPR) on board the Jupiter Europa Orbiter during its two of its close flybys. extent of differentiation, and contributions to the atmosphere, magnetosphere, and torus. ionosphere, the dominant mechanisms of mass loss, and the connection to Io’s volcanism. The second part of the Io white paper, Recommendation for Missions, was more extensively discussed in my last post on this subject. To answer Ted's comment for that post, where he suggested that IVO, a proposed Discovery-class Io mission, would be the most likely to fly, keep in mind that what is discussed in Part 2 is an exploration program, akin to what is currently going on for Mars. For Io, this program would start with either a New Frontiers- or Discovery-class mission that would orbit Jupiter and flyby Io on several occasions. Such a mission could be flown in the 2013-2023 decade covered by this survey. Following this "Io Observer" mission, the next decade, 2023-2033, could see a follow-on mission that would orbit Io, providing detailed global maps using UV, visible, and near-infrared imagers and a laser altimeter, as well as measuring Io's gravity and possible magnetic fields, and deploy one or more in situ components, such as penetrators, landers, or rovers. One important task for these in situ missions would be to measure seismic activity using seismometers. Enough activity should be detected over a period as short as a day to provide a more detailed model of Io's interior structure. 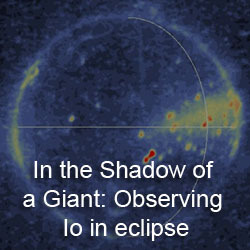 Finally, the authors support telescopic observations of Io from Earth or from space-based platforms, including a UV telescope that would replace the capabilities that will be lost once Hubble is de-orbited and additional ground-based telescopes with adaptive optics capabilities, which would help ease scheduling pressures at telescopes such as Keck II. These observations would allow for monitoring time-variable phenomenon at Io such as satellite-magnetosphere interactions, Io's atmosphere, and its volcanic activity. We recommend that NASA pursue a balanced solar system exploration program between life-focused and physical-science focused missions.